The Pulling Linemen: Where Will Peyton Manning Land? Everyone else has had their say, so here’s some opinion from me about where #18 might decide to go. Because let’s face it, it’s going to be his decision. So what do we know about Peyton Manning? We know he’s going to be 36 at the end of the month, coming off of 4 neck surgeries. His style of play has always been dependent on a secure pocket from which he can weave his magic as well as the freedom from his coaches to call the offense from the line of scrimmage. But what about Peyton’s personality? Clashes between head coach and quarterback can be poison to a team’s chances, and he’d have to gel well with his new boss as well as his new receiving corps who would have to put in a serious shift this off season to get up to speed with all of Manning’s pre-snap changes. One thing to consider here however, is a package deal. Jeff Saturday and Reggie Wayne are also free agents, if you were going to take Peyton Manning on for a run at the title, wouldn’t you try and pull in the 2 guys who have the best understanding with him too??? Miami have been trying to make a big splash with head coaches recently, only to see Jim Harbaugh and Jeff Fisher turn them down to head out west. So you can easily see them going after the Peyton here. They don’t have an incumbent quarterback despite Matt Moore’s good showing in the second half of the season while also having the hugely talented Brandon Marshall at wide out. Their offensive line, anchored by left tackle Jake Long and Centre Mike Pouncey (who can easily slide to guard if they were to sign Jeff Saturday too) is among the toughest in the league. 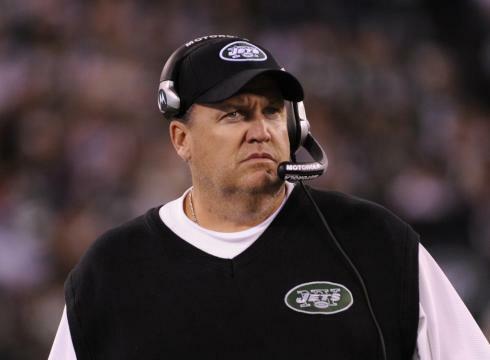 It would also be a perfect match with new head coach Joe Philbin. The former offensive co-ordinator was never a play caller with the Packers, and having a QB who can show him a thing or two in calling a game would be a good thing for the rest of his career. There’s also the fact that Miami would play the Patriots twice, a game Peyton Manning relishes, and would match up against Indianapolis in 2012, giving Peyton a shot at his successor Andrew Luck. They also have the 8th pick in the draft, giving them an opportunity to sign either a right tackle to help look after Peyton, or another wide receiver to help him out. It all looks like the perfect scenario. Which means it probably won’t happen. The passing game was all that held the 9ers back from a Super Bowl appearance and starter Alex Smith is a free agent, so why not bring Peyton Manning in? They can offer Peyton the one thing that he’s never had at Indy. A stellar defense. There would be no intense pressure to go out and score 30 every week because the D can’t stop a nose-bleed. It would certainly be a more relaxing environment for Peyton: away from the east coast spot light, a good ground game with Frank Gore and a stellar offensive line. Life behind Joe Staley, Mike Iupati and Jonathan Goodwin would be pretty easy for Peyton Manning. Could a dominant defense tempt Peyton out to the Bay? But he would have a lot of work to do with receiving corps. Behind tight end Vernon Davis there doesn’t seem to be a great deal to work with. Former 1st rounder Michael Crabtree is slowly drifting towards bust-land (not as fun as it sounds) and behind him is a barren wilderness. Obviously that could be solved by bringing Reggie Wayne but Peyton’s preferred formation is almost always 3 wide receivers & a tight end and they would still be 1 decent receiver down. The other thing is the way Jim Harbaugh runs things. He’s a high intensity coach who runs everything his way. Would he be willing to, or even be able to cope with, handing the offensive reins to Manning? There is also a very definite, old school feel to the way Harbaugh runs an offensive, normally power running teams to death with 2 tight end sets. He would have to throw most of that that out of the window to incorporate #18, and it can be a difficult job for coaches to wholesale change what they do. Joe Montana 2.0? In 1993 the Chiefs brought in Hall of Fame Quarterback after San Francisco decided to stick with Steve Young as their guy going forward. Well the chance has come up again to bring in hall of famer who’s being replaced by the next big thing. 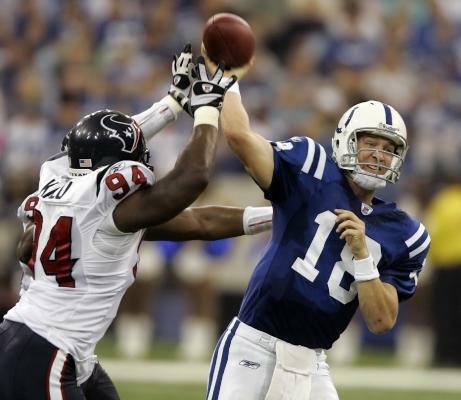 Romeo Crennel, newly appointed head coach has expressed a desire to bring Peyton in, and he would know exactly what he was getting too. As defensive co-ordinator for the New England Patriots between 2001 and 2004 Crennel had to have a plan in place to stop Peyton Manning twice a year, which he did to great effect. 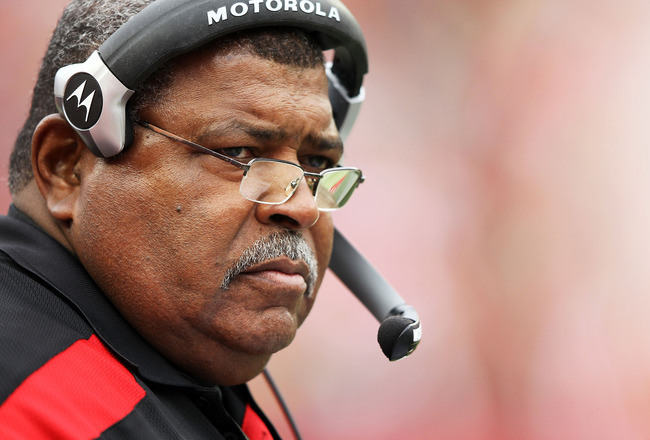 Romeo Crennel knows where the holes are in Peyton's game. Wouldn't that make them a deadly duo together? The Chiefs certainly have the cap room to give Manning a hefty contract too and Matt Cassel hasn’t done enough to prevent them bringing in someone of Manning’s calibre. His presence would also help them lock down currently franchised wide out Dwayne Bowe and possibly tempt free agent Brandon Carr to come back too. Young stars Jamaal Charles and Tony Moeaki will be back after suffering knee injuries last season. It would be a place where Peyton will have young, mouldable pieces around him and a crowd just dying for a star. Unlike Miami and San Fran Peyton wouldn’t have to play under the long shadow of recent quarterbacking heroes. Len Dawson retired in 1975; it’s been a long old time since KC had anyone close to that at Quarterback. If Peyton wanted to go to a competitor then this would look like the place to go. However the fact that they’re in the same division as the Colts rules this out for me (Tennessee would be a different matter due to his college career there). Is Peyton pissed off enough to join the enemy? As hard as it must have been for Peyton Manning to have the Colts tell him “we don’t want you back” I don’t think there’s any bitterness or vindictiveness about it. If he was pissed at them then he’d have already signed a league minimum deal with Houston and be preparing to crush Indy with Arian Foster, Andre Johnson and that fierce defense. But as it is I think he’ll say no to Houston and look further afield than the AFC South. Dan Snyder has a history of splashing out on the big free agents, and none have been bigger than Peyton Manning. But there are a lot of question marks around their offense. With a serious lack of effective receivers plus the state of their offensive line in the air with left tackle Trent Williams facing a suspension and the interior in flux. It would certainly be a difficult place to come in and win straight away for Manning. Is the lure of RG3 enough to stop the 'Skins chasing Manning? I’m also certain he would rather avoid stepping on Eli’s toes by coming into the NFC East, while the ‘Skins seem to be very keen in pursuing Baylor’s Robert Griffin III. Peyton Manning or Mark Sanchez? Hmm, that is a tricky one… NOT. Manning would be a massive upgrade for a team that will guarantee a Super Bowl this august (and that’s a guarantee). But the Jets are the NFL antithesis of Peyton Manning. They’re loud, brash and undisciplined. There’s little camaraderie there and Peyton would be going into the pressure cooker of the New York media where they would play up the fact that he’s coming into his brother’s city. Could Peyton really co-exist with the angriest man in New York? While I’m sure Peyton admires Rex Ryan’s ability to put together and run a defense I don’t think they would get on at all as a head coach and quarterback. They’re just too different. Anywhere with a good QB/young already in place!